A Stormont department has withdrawn funding for a high-profile scheme that brought students from the US to study in Northern Ireland. 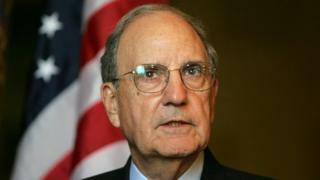 The George J Mitchell scholarship programme is run by the US-Ireland Alliance. It is named after the American senator who chaired the Good Friday Agreement negotiations in 1998. It enabled up to four students to spend a year of postgraduate study at Queen's University or Ulster University. The funding was withdrawn by the Department for Employment and Learning (DEL), which had contributed around £65,000 a year to the programme. In a statement, DEL minister Stephen Farry said that, "in light of the current budget situation", he had removed funding from the scheme. The Mitchell scholarship scheme began in the wake of the Good Friday Agreement, with the first intake graduating in 2001. It was set up by the US-Ireland Alliance, whose President Trina Vargo is a former senior United States foreign policy advisor. She worked closely with the late Senator Edward Kennedy to enable Sinn Féin president Gerry Adams to be granted a visa to visit the USA in 1994. Ms Vargo said that, although the numbers involved were small, the programme was symbolic and influential. "It's important to Northern Ireland to have a connection to future generations of American leaders," she said. "We're looking at Americans who are going to be future leaders in their fields in the US." A number of former Mitchell scholars are now in important positions in public life in the USA. Ms Vargo said that the programme was as important to relations with Northern Ireland as the Rhodes scholarship programme has been in wider relationships with Britain. Rhodes scholars from the USA spend a year studying at Oxford. Former US President Bill Clinton is a former Rhodes scholar. When asked why Northern Ireland's Executive should pay for American students to study here, Ms Vargo said that the funding from Northern Ireland had wider benefit. "The Mitchell scheme promotes Northern Ireland in the United States," she said. "The programme has become so prestigious that in the past three years, of the 10 people lucky enough to be invited for both the Rhodes and Mitchell interviews, eight opted for the Mitchell scheme, forgoing the opportunity at Oxford to study in Ireland and Northern Ireland. "What is equally important for Northern Irish universities is the profile the Mitchell gives to those universities in the USA every year; they've been put on the map with Americans seeking to study abroad because of the Mitchell [programme]." The scheme will continue sending students to universities in Ireland, but Ms Vargo says that unless individuals or companies come forward with private funding, no Mitchell scholars will study in Northern Ireland after 2015.